It is hard to explain the repressed excitement. It is hard to explain the shuttered gasps of interest. The shocked comment blurts forth at full speed. Situation analysis starts. Decisions need to be made. Strategies swarm to the forefront of the mind. Losses are calculated and accepted. Gains are pondered on their current worth more then the future. Changes become fast and rapid, flickering by so quickly that they stun from the other side. 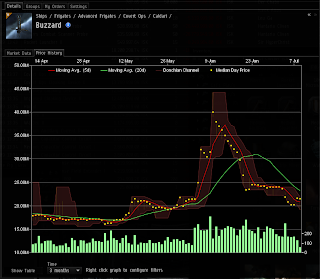 Look at that price dip on Buzzards. The changes that have heaved T2 frigate prices on a roller coaster are plunging down again. The side effect is that I am stuck with overpriced stock. I have to take a loss. But, my damage control activation earlier in this spike left me with only 1 over priced ship instead of a stack of them. It won't hurt. Not every moment is going to be profit in these situations and having stock available is to important to hold my breath and wait it out as I might have done if I was not supporting a community project. I mitigated my loses nicely, in my opinion. Then I had another problem. I have too much liquid ISK. I can't figure it out except that I did some price adjusting about two weeks ago because I had narrowed my margins to ridiculous levels on many items I was just breaking even. I decided that I was hurting myself and hurting the stores growth and rebalanced it a bit closer to what I was originally working with. The improved income has allowed me much larger stocking opportunity which is causing fewer and fewer buy outs each day with the side effect of suddenly having some liquid ISK rolling around. The entire situation is hysterical. When did I become so obsessed with the market? I don't think I ever looked at some of the various graphs and charts except for the occasional check when selling various items. Now they are important. Naoru asked me what the cost of an item was and upon finding out that it had dropped I automatically asked him if he wanted a screen shot of the chart to make his decisions. And so I turn, with bright eyes, to share this stuff and the boys listen to me because they are fond of me. They don't say, "Sugar, you bore us," and in turn I try to bite back my surprise and interest and desire to chatter nonstop about these things. The comment has been raised that there are few Market blogs. That is true. There are many reasons from protecting trade secrets to just a lack of interest. Another is that market blogs are hard. Even from one market to another there may be a lack of interest in that type of market. I don't station trade for instance and I cannot wrap my head around it even with all the attempts that I have made. Others do not want to manage some 600 buy and sell orders to maintain a market hub. And it is hard to make numbers exciting or explain why I am thrilled at the dropping price of Buzzard's even thought it means a personal ISK loss to me. I've been writing this blog for a year and a half now, starting two weeks after I started Eve. The main point has been a chronicle of my time in Eve and the path that it takes me interspersed with my own thoughts and reactions to the game. At no point did I ever think I'd wander into this field of the game. At times, I'm so fascinated by my efforts in the market that I have a hard time not bringing it into my corp and coms discussions. Not that people have not found random advantages in it. From my regular Jita trips to my ability to given Intel on various fits, it has a strange place in my game society. I do worry at times if it will unintentionally alienate me from my social group. I think not, however. They, after all, do seem to enjoy their reasonably priced items and a steady supply of stocked boosters. A corporation, alliance, or even loosely structured social group needs a bit of everything and everyone. I may have accidentally carved this niche but I am rather comfortable here. Instead of focusing on what I am not I need to spend a bit more time looking at what I am and the value that it brings. I don't think anything is wrong with a well skilled pilot that prefers to fly tackle and truly enjoys logistical work. I like this little place I've made. 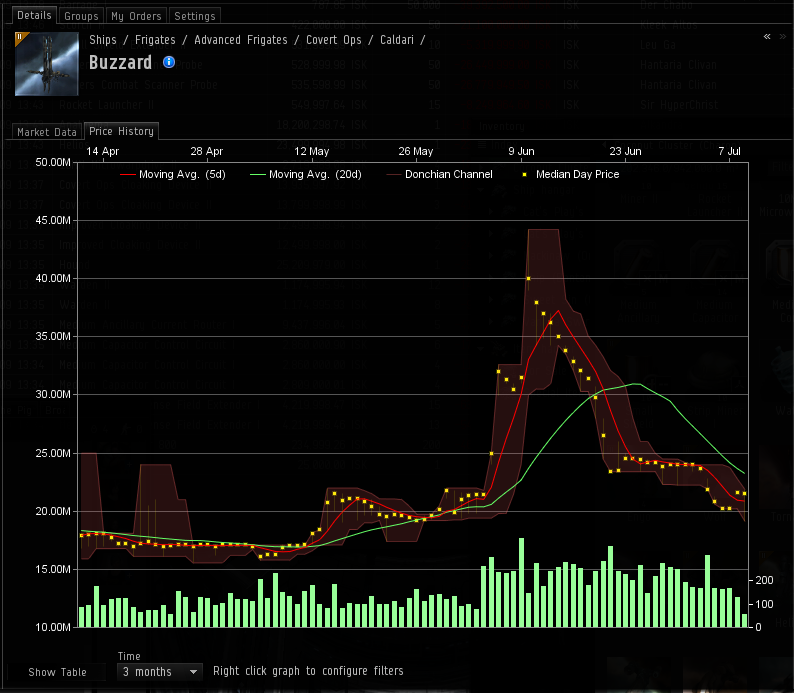 I'll admit the market aspect of Eve doesn't intrigue me very much. I definitely think it's amazing and I respect it, but it's not something that I personally get into too much. That being said, I do enjoy reading your take on things. I think you have a strong writing ability and to me it doesn't matter if you are writing about the market, pvp, or game politics. It's good to see your enthusiasm for market play. Too few players are interested in making money by serving the local community. If you like to play tackle, why don't you learn Heavy Interdictors? With focused script they can work in lowsec, pointing from 36km with infinite strength while having non-zero DPS. Maybe it's the ship that you'd like. I could fly Hics with a bit of training. They have value to us but we tend not to use them in a common fleet. Again, it goes down to price. A broadsword is 248 million ISK at the moment in Jita. That is rather pricey for a daily ride compared to my Jaguar's 27 million ISK price tag. We do use broadswords. I do not have unlimited ISK to burn. And most of the time a Jaguar will do quite well for tackle. Tl,dr: Keep up the good work and continue blogging! In the end, you are still doing the same thing with your blog: Writing about your experiences in and musings on EVE. It's just that now you are doing different / additional activities ingame. I, for one, still appreciate this little window into daily life in low-sec. Most other Low-Sec blogs I know are focused more or less completely on the pew-pew. That makes it easy for me to forget that there are low-seccers ot there who do not use it as a free-for-all brawling zone only.